Celebrate your love by wearing personalized couple’s necklaces. It’s a good way to strengthen your relationship and show how much you love each other. Limoges Jewelry has a large collection of customized pieces specially designed for loving couples. Couples necklaces are a charming way to tell the world about the one you love. Designed as a complement to the more popular couple's rings, couples necklaces & pendants have emerged in their own right as a beautiful and meaningful accent to any outfit. At Limoges Jewelry, we've got an assortment of styles, including birthstone necklaces and name necklaces. We've also got plenty of popular designs, like key necklaces, puzzle necklaces, and and linked hearts. 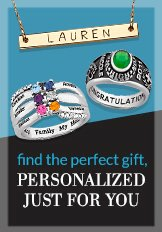 We're one of the most trusted sites in the industry for personalized jewelry - so you can rest assured that the couple's pendant you get is the one you want. Check out some of our favorite designs below.